Produce reports and studies related to regional maritime safety and security and the marine domain in general. Based on information from Parties and Partners, the RMIFC receives, processes, fuses, stores, shares and exchanges information with the objective of issuing an alert in the event of imminent or proven danger to maritime security and safety in its ​​general area of interest considered to be the regional maritime space laying between latitudes 26 ° North and 37 ° South and longitudes 20 ° East and 76 ° East. 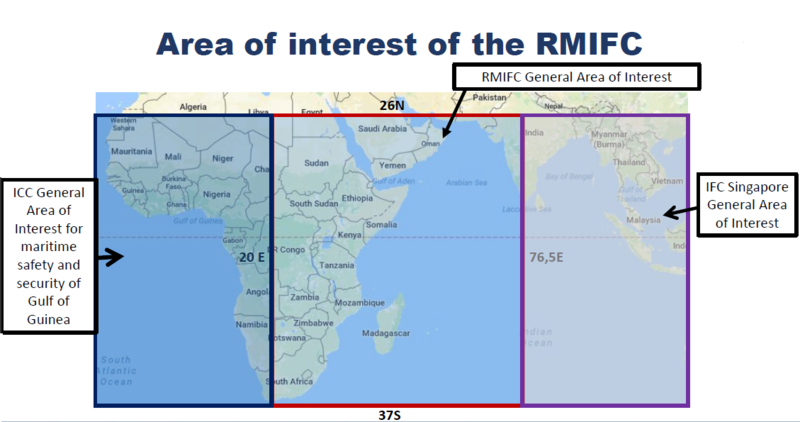 The general area of interest of the RMIFC is complementary to that of the IFC Singapore in the east and the Gulf of Guinea maritime safety and security architecture in the west. Daily briefing of RMIFC: The briefing retraces daily the information on maritime situation, meteorological bulletin, period of darkness, situation of maritime traffic, recorded maritime events during the day thanks to the collected maritime data but also to the information provided by various actors in maritime sector in context of voluntary naval control, data shared by national, regional and international partner centers as well as International Liaison Officers. ESA-IO Ports Maritime Traffic Status: This report describes the general status of maritime port traffic in the ESA-OI region. The ESA-IO Ports Maritime Traffic Status is produced on a daily basis. 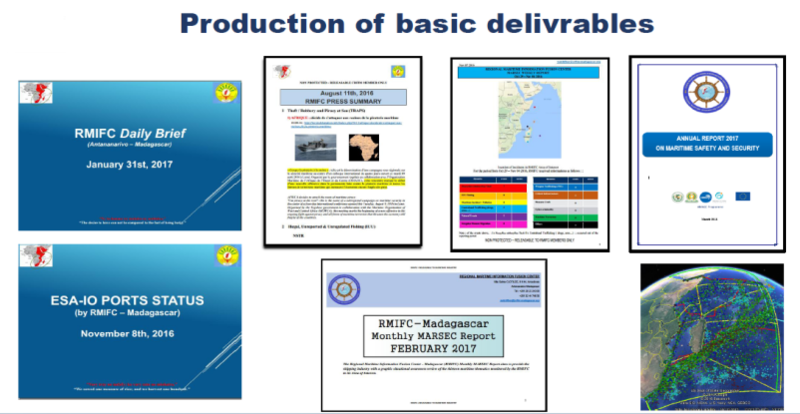 Press summary: The RMIFC summarizes major events in maritime field reported by national, regional and international media that also published on its official website, as well as visible on its Twitter account and Facebook page. The Press summary is also produced on a daily basis. Recognized Maritime Picture (RMP): The RMP, in a form of a Google file, is a summary of the day situation relating to the maritime traffic in the general area of interest of the center and the geo referenced events of the day. Weekly Report on Maritime Safety and Security in the ESA-IO region: This report summarizes major events of the week related to maritime safety and security in the general area of interest of the RMIFC with analysis of the major themes of the week. Monthly on Maritime Safety and Security in the ESA-IO region: This report summarizes the events of the month related to maritime safety and security in the general area of interest of the RMIFC. Its main purpose is to provide to maritime stakeholders in the region with a graphic analysis of the maritime situation for each topic related to maritime safety and security followed by RMIFC in its general area of ​​interest during the month. It also reports the statistics of the events for each theme that occurred in the area of ​​interest, their details, such as the region affected, date of the event and the type of vessel involved. Annual Report on Maritime Safety and Security in the ESA-IO region: This report summarizes events over the year related to maritime safety and security in the area of ​​interest of RMIFC. In this annual report, each theme is analyzed individually by highlighting the statistics, the operational issues and the effects on maritime activities.